As much as I love sweets, sometimes I crave vegetables. Recently, I’ve been craving carrots. Maybe because they remind me of Spring. Carrots are naturally sweet and nutrient rich. What’s not to love? I decided to create a new soup. It had to be simple, because I didn’t want to spend a lot of time on it. I was really downright lazy with this recipe. I was working fast when I made it and didn’t stop to write down ingredients. This is a very loosely pulled together recipe based on what I remember. The amounts are not exact. But it’s good at demonstrating that homemade soup can be quick. You can make it spur of the moment with what you have. I used the last of the POM Pomegranate Juice for some added antioxidants and flavor. Use butter or margarine, if you don’t use Smart Balance. Use olive oil if you don’t have grapeseed oil, or just increase the amount of butter, etc. Substitute with similar ingredients. 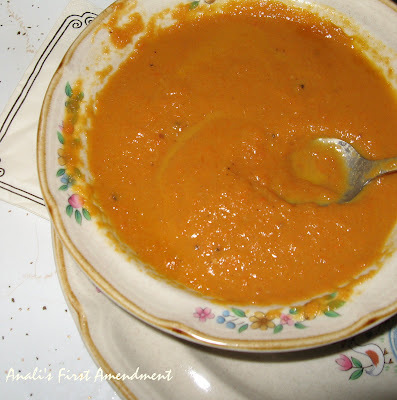 This carrot soup may be the best soup that I ever made. Both G and I loved it! I kept meaning to photograph it again, but we ate it all before I got the chance. I’ll be making this soup again soon. Use a large pan that has a cover. Add the Smart Balance and oil to the pan and turn up the heat. Cut the carrots into thirds and add with the onions to the pan. Sauté onions until soft and light brown. Pour POM Juice over carrots and onions and cook until juice is almost fully absorbed. Add ground ginger, garlic powder, lemon pepper, salt, brown sugar and cover with chicken broth. Stir ingredients. Cover and turn down heat a bit. Let simmer until the carrots are soft. Let cool. Use an immersion blender to cream the soup. Enjoy! The addition of POM juice is very interesting! Ooh, the POM must add just the right amount of tang. Delicious! jen - And a very nice addition! susan - It did add a nice amount! I just made the soup again, because it was so good. Unfortunately, I ran out of POM, but I did add parsnips this time. Still very good! shirley - I love this soup! I'm getting ready to make it for the third time. Hopefully more restaurants will become aware that they can make soups gluten free without sacrificing taste or anything. The avocado citrus soup that I had recently was gluten free and one of the best soups I've ever eaten.